A competitor in the Talkeetna Wilderness Woman competition tries to snowshoe through an obstacle course in 2014. This weekend is chock full of fun-filled events in all corners of the Mat-Su Valley, as Wasilla hosts the Autumn Fest at the Dorothy Page Museum on Saturday, and Talkeetna Winterfest takes over the upper Susitna Valley. The world-famous Talkeetna Bachelor Auction and Wilderness Woman competition is set for Saturday. These are quintessential Alaska events and are not to be missed. 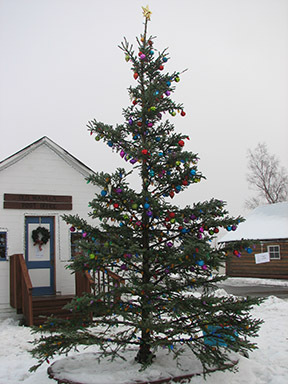 Part of the month-long Winterfest celebration, the weekend in Talkeetna gets off to a start on Friday, with the Motorized Parade of Lights. On Saturday morning, the train arrives from Anchorage, presumably filled with single women. Members of the Talkeetna Bachelor Society greet the train, and then the Wilderness Woman competition begins. This hilarious competition includes women racing up and down Main Street with five-gallon buckets of water, chopping wood, navigating an obstacle course in the town center, and even "shooting a moose." While many of the women are dead serious about earning the coveted title of Wilderness Woman, there is definitely a lighter side feeling to it, as many contestants dress up in costumes, racing through town to the delight of the cheering fans. Saturday night at the Sheldon Community Arts Hangar, it&apos;s the bachelors&apos; turn to strut their stuff. Literally. The bachelors take to the stage and are auctioned off to the single women in the room. The women are entitled to a drink and a dance with their bachelor at the Bachelor Ball that night. Best of all is the fact that all the money that is made through the auction of the bachelors is donated to social service organizations in the Talkeetna area. If Wilderness Women and Talkeetna Bachelors aren&apos;t your thing, make your way to the Dorothy Page Museum in downtown Wasilla this Saturday. From 1-4 p.m., there will be hay rides, hot cocoa, cider, a dance recital, live music, storytelling and the Christmas tree lighting ceremony with Mayor Bert Cottle. Don&apos;t forget to bring an unwrapped toy - the Dorothy Page Museum is a Special Santa drop-off point this year.